January is going fast isnt it? In the last week I have finished 2 WIP’s – The Pachimari and the OFAPUK Octos, which I will share with you later in the month once my co-ordinator has received them and sent me some feedback. I have also started and finished another project, which I will post about tomorrow. I currently have 2 WIP’s. The first is the Kindred Spririts Scarf. (I have only added a few more rows so here isnt much to show you. I go off to Basingstoke to start Signalling School tonight, and will be taking this project with me so will at least get a couple of hours progress on the train. And last night I started a chunky baby blanket, taking inspiration from the filet honeycomb section of my Hotel of Bees shawl. It’s Wednesday again! and in total contrast to last week, this week I have a whole lot of WIP’s. 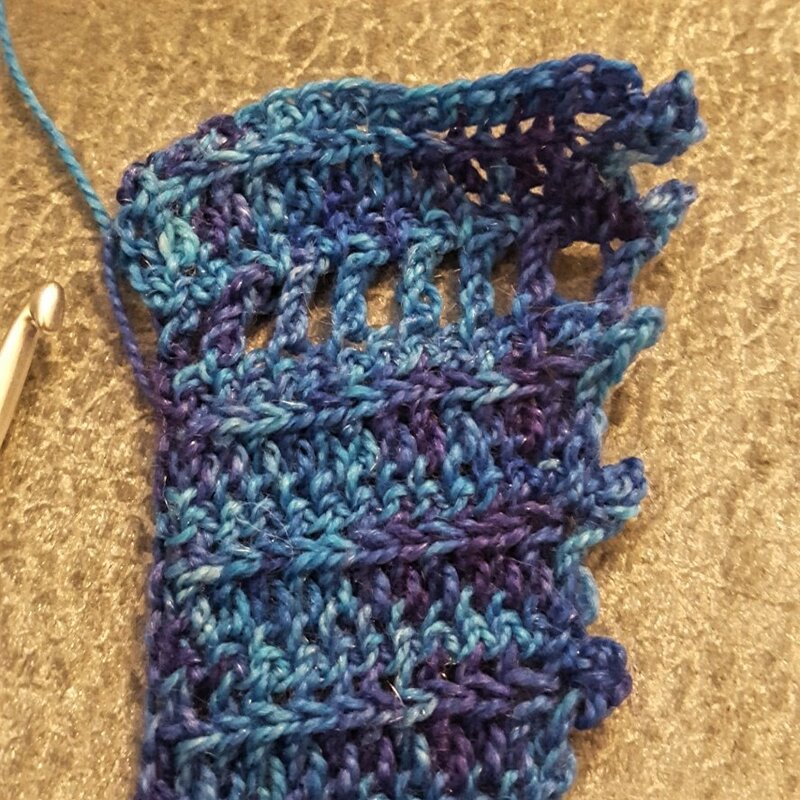 I have made a bit more progress on my Kindred Spirits scarf. 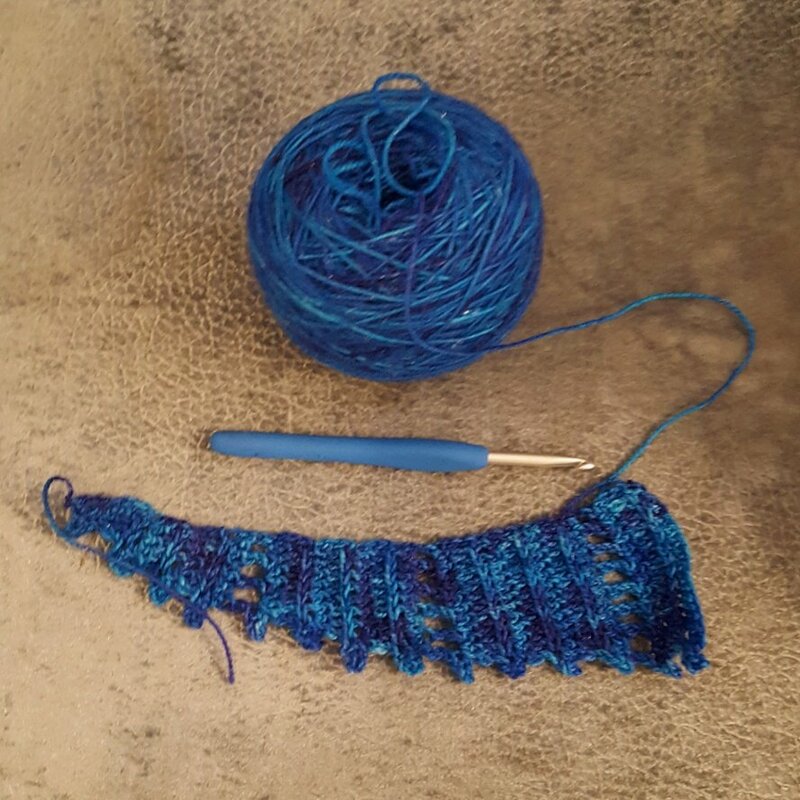 I am about 30 yards short of the required amount but the scarf is super long so I think when I get to a repeat of two before the halfway point I will weigh my yarn, then just start decreasing at the 50g mark. As the scarf is really long – (90 inches) I think I can afford to loose a few inches and still have a very long scarf. I attended an OFAPUK meeting at the weekend, and as usual, this spurred me I with a bit of motivation. I have a huge box full of cotton’s specifically for Octos, but I decided that before I can crack open any new balls, I really ought to get through the scraps of yarn I have lying about. I am also working on a Birthday present for my Fiance, for his 31st birthday, which is coming up next week. He will be in Germany on his actual birthday, attending a conference and delivering a speech as part of his work, so we will be celebrating a day or two earlier. I am trying not to buy too much yarn but when I was working on the Loot Llama I identified that I could use the remaining yarn for a second video game related Amigurumi. But I will say no more, just in case he decides to look here. Wouldn’t want to give away too much and ruin the surprise. He already knows one of his gifts thanks to a delivery box absolutely smothered in company branding! Once I have finished these bits and bobs, I think. 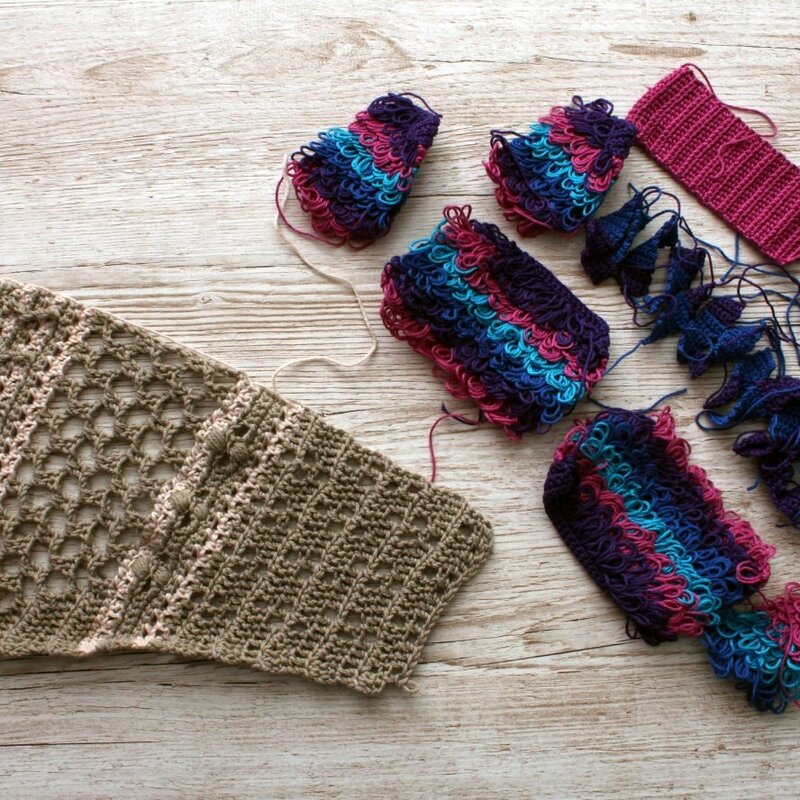 will start on a baby gift – it’s so hard to resist starting a new project! Someone send me the strength to keep focused on my already existing projects! Goodness me. I am in Vienna right now and wow is it cold! So much snow! 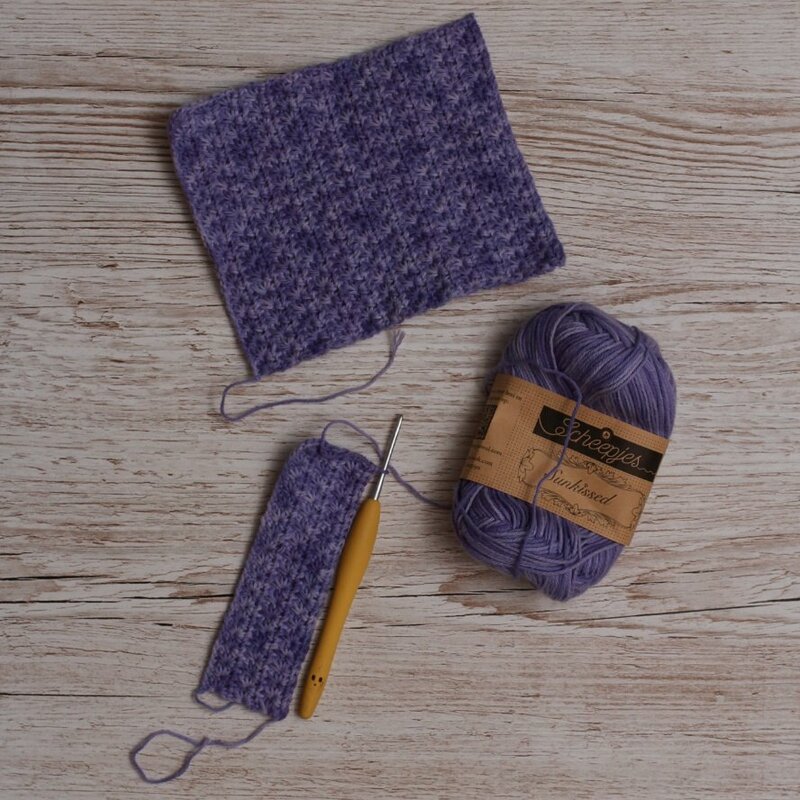 I only have 1 wip at the moment – the Kindred Spirit Scarf. This is how far I got on the flight here. Lets see how far I get on the flight back. I have just one WIP this week. I am starting with a little project. My fiance got me a folding wireless keyboard for christmas – I do the majority of my blogging from my mobile phone, and Chris worries about my carpal tunnel syndrome as a result. So he thought this would be a very useful thing to me. And of course, I had to make a case for it. So this is the start. I am not following a pattern – I am making a pair of star stitch rectangles then will stitch them together into a pouch and add some edging and a button. How did you christen the new year? I hope you all had a wonderful christmas full of love and laughter. Its Boxing day now, and its the last WIP wednesday of the year! I am crocheting monogomously at the moment – now all of the gifts are finished I am determined to complete my Esja sweater by new year. I have added a good 4 inches since I last shared it with you, but we are now at the boring bit which just goes round and round and round until its long enough. Then onto the sleeves. 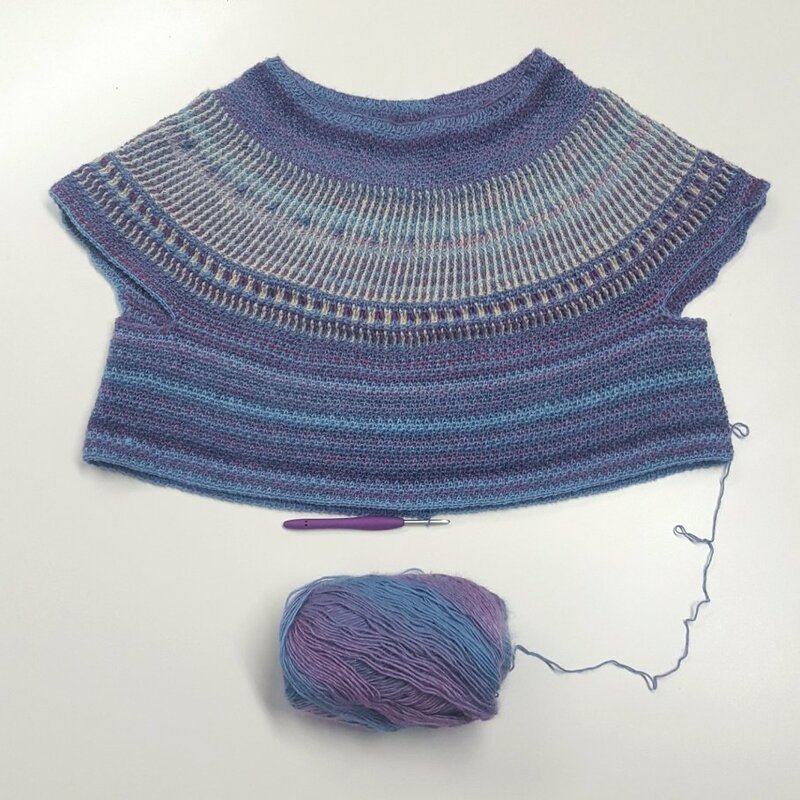 It currently sits an inch below my bust so I reckon I need another 12 inches at least – but I am on night shifts for the next 7 nights so at least I will have plenty of time to do it! 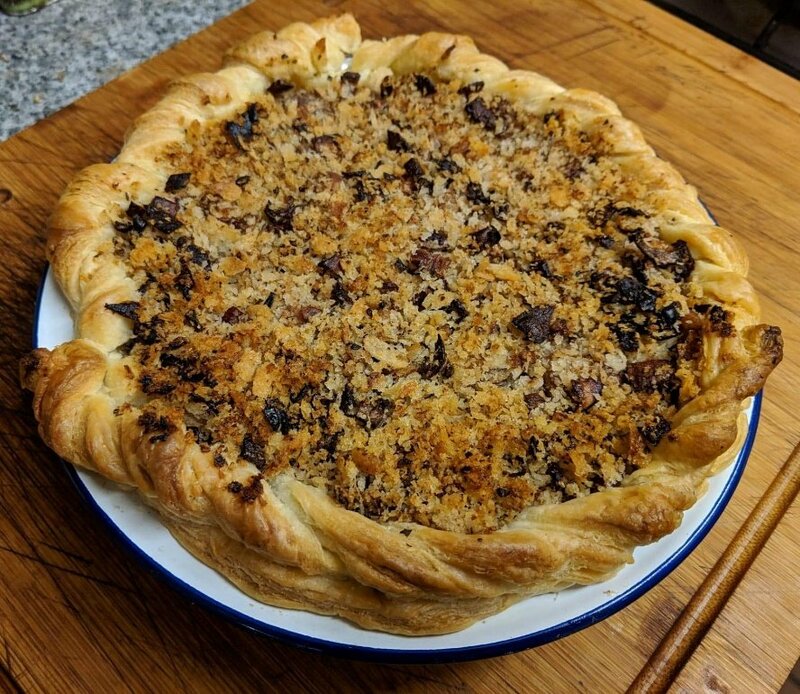 Before that though, its time for the best bit of boxing day – my signature leftover pie! Have a lovely day everyone! Good morning everyone! My goodness christmas is now less than a week away! I have spent the majority of this week cuddled up on my sofa with my fiance crocheting like theres no tomordow! I have 3 projects on the hooks right now. My esja, which has been put on the back burner until the christmas gifts are complete. A loot Llama – currently in many parts I have more parts to make then I will sew it all together at the end. And the Hotel of Bees shawl for my step mother in law. I hope to finish and block this today, as it needs to be dry by friday for gifting! Are you still finishing christmas gifts? If so good luck!